Anyway, it all happened one rainy day. We wanted some soup, and we decided on okra, but we were not sure what type, so we took a short trip to the Farmer’s market. As I put the okra in our shopping cart, I sighted some Callaloo A.K.A Efo tete and some fish and I decided to get some to add to the fresh okra. On getting into my kitchen, this recipe was born. Not only is this recipe versatile in the sense that it can be made with or without oil, the okra comes out very crunchy. And apart from the very many benefits of okra, this is one sumptuous soup we never seemed to get enough of. Growing up, my mother always made different versions of Okra and I guess that is where my love for the vegetable comes from. With this recipe, it was my first time using Efo tete in a long time and you could not even tell that the leaves were in the soup. It was so light and airy and each scoop delivered maximum flavor and nutrition. The way the ingredients married themselves in the pot was so beautiful. Another beautiful thing that happened was me eating it with roasted plantains. Kaii! It was an idea from my friend Remmy and after that day my taste buds never remained the same. 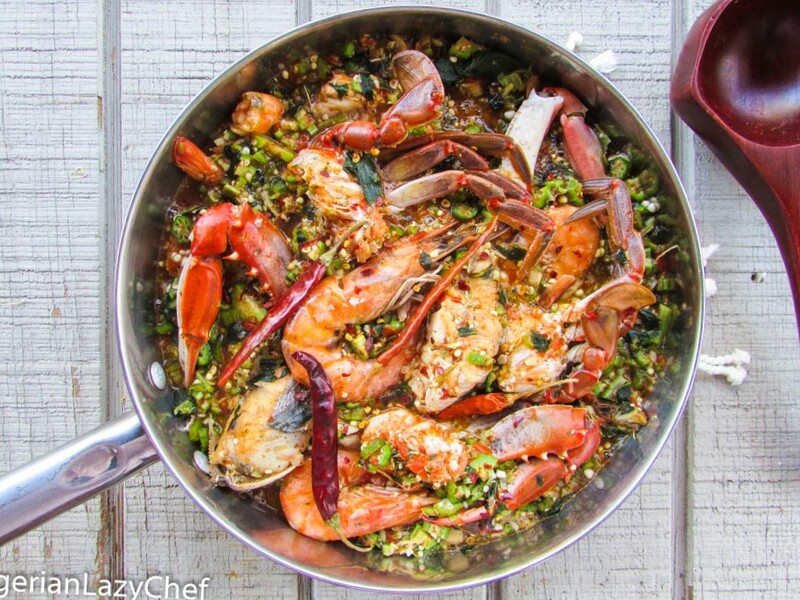 Season the crabs, fish and shrimp with salt and the dry pepper; then set aside. Place all the sea food into a soup pot and pour in some water to the level if the seafood. Season with a little salt and let it cook for about 5 minutes or until the seafood is cooked and the Shrimp/prawns have turned pink. Gently remove the seafood from the stock and set aside. Pour out some of the stock just incase it is too much. Pour the pepper mix into the pot with the stock and stir. 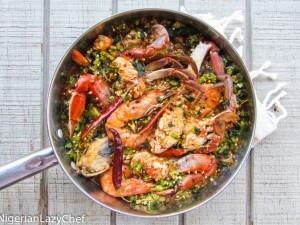 Bring to a boil and cook for about 3-5 minutes; then add the okra, crayfish and the dry fish; then reduce the heat. Cook for only a few minutes as you do not want the okra to loose it's color and crunch. Stir in the seafood (don't worry about the fish breaking apart) and the tete leaves. Season to taste and set aside. The steam in the soup will cook the vegetables Enjoy with any swallow or even roasted plantains. This entry was posted in Fish peppersoup, Fish recipes, fresh fish peppersoup, Gluten free recipes, Healthy Eating, Healthy Nigerian, Healthy Nigerian Dishes, Nigerian soups, Nigerian Stew, Nigerian stews, Okra soup, Soups, stew, Stews, Uncategorized and tagged African soups, Nigerian food blog, Nigerian soup recipe, Nigerian soups, oiless okra soup recipe, oilfree okra soup recipe, Okra soup recipe, Okro soup recipe, seafood okra soup recipe. nice 1,it will go 4 iyan(pounded yam),pls it is a most 2 use prawn. Hi Omolara,thank you. It’s not a must to use prawns.